Fe2+ solubility decreases significantly as the pH rises, causing an iron (and other oxides already mentioned) hydroxide insulating film to form; this takes the form of a preponderating increase in cathodic surfaces; anodic zones become reduced to punctual areas. The density of the corrosion electrical current will increase over these anodic zones as their surface decreases. 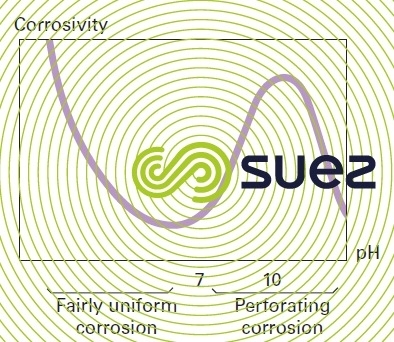 The danger of pitting corrosion in the presence of oxygen increases as the pH approaches 10; beyond this value, the corrosion process decreases; it ceases at pH 10.5 for most water (figure 10). Thus many localised corrosions have been recorded in the presence of decarbonated water with a pH of between 9 and 10 and where alkalinity was no longer sufficient for maintaining the Tillmans film (see natural water used in carbon steel passivation).